The Silver American Eagle was soaring in the 21st century. Economic fears in the United States in 2001 had shifted from the impact of Y2K to the Dot-com burst in the tech sector, and the terror attacks of 9/11 late in the year. All these factors combined to make the 2001 Proof Silver American Eagle one of the highest mintage years in the program to date. 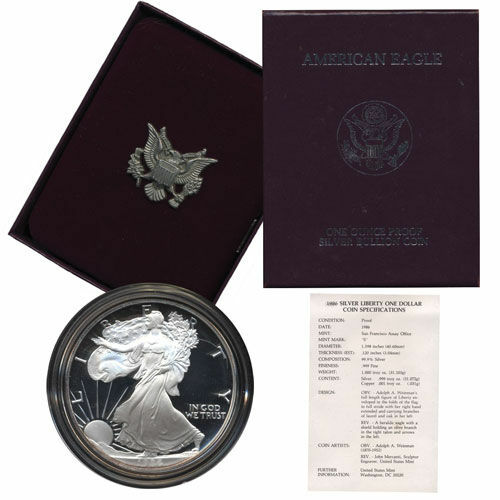 Today, Silver.com offers the 2001-W Proof Silver American Eagle for purchase. Total mintage of 746,398 coins in the proof version. 15th Anniversary of the Silver American Eagle! Mintage levels for the Silver American Eagle in the early 2000s were just starting to take off and reach new heights. After averaging a mintage of roughly 6.1 million each of the first five years of the program in the 1980s, the 1990s saw mintage levels much lower on average, hovering around 5.2 million annually. Economic uncertainty and the damage done to the American psyche on 9/11 combined to rattle stock markets in 2001, resulting in level demand at a much higher mintage for the Silver American Eagle in 2001. After a total mintage of 9.8 million in 2000, the program saw mintage both drop (bullion) and increase (proof) in 2001. Bullion coins dropped from 9.2 million in 2000 to 9.001 million in 2001. 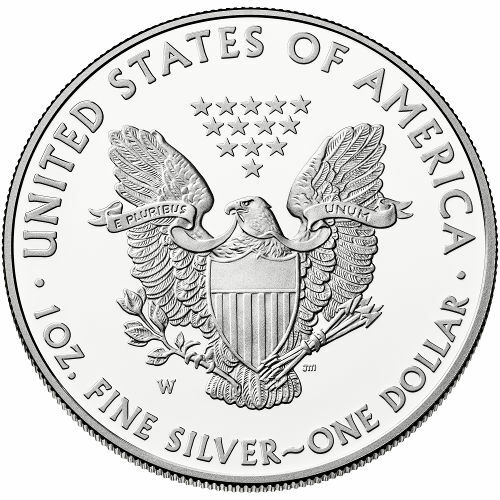 The 2001 Proof Silver American Eagle recorded the biggest single-year gains in proof mintage history. After striking 600,000 coins a year earlier, mintage jumped in 2001 by 146,000 coins for a total of 746,398. 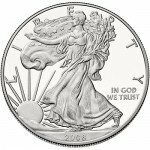 More importantly, this was the first year Proof Silver American Eagle coins were struck at the West Point Mint and featured the mint’s “W” mint mark. It was also the first year of bullion production at West Point, as both coins shifted there from the Philadelphia Mint. Both coins continue to be struck at West Point today. 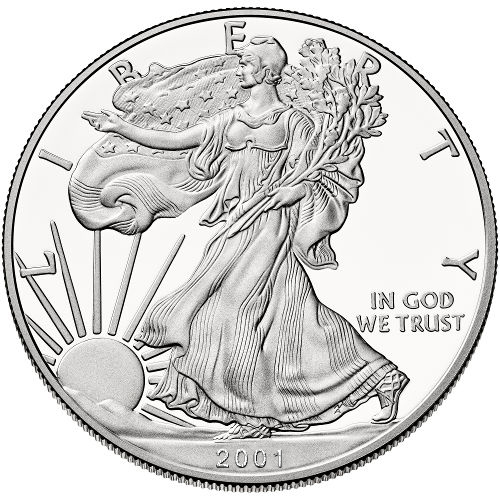 Adolph A. Weinman’s Walking Liberty is still found on the obverse of all Silver Eagle coins, accompanied on the reverse by John Mercanti’s heraldic eagle design. If you have any questions, please contact Silver.com at 888-989-7223, chat with us live online, or email us directly.